Tinea solium, Dirofilaria, and Rhinosporidiosis parasitic infections are not so commonly seen. Moreover, eye is an unusual location for any parasite to harbor. The clinical presentation was also unusual. Three cases of these unusual parasites at an unusual location with an unusual presentation are detailed. Taeniasis is a zoonotic infections caused by cystodes or tapeworms named Tinea. There are two species of Tinea namely T. saginata and T. solium causing tineasis. They are called as cyclo- zoonoses because they require more than one vertebrate host to complete their developmental cycle (no invertebrate host).T. saginata is caused by eating infected beef and is virtually present worldwide. Tapeworm infections caused by T. solium are more prevalent in underdeveloped communities with poor sanitation and where people eat raw or undercooked pork. Higher rates of illness have been seen in people in Latin America, Eastern Europe, sub-Saharan Africa, India, and Asia. A 17-year-old young male patient presented with complaints of redness and swelling around the right eye for 10 days. He gave a history of noticing a small mass in the right eye for three months. The mass was painless and growing very slowly. There was no watering of eyes, itching, or foreign body sensation. There was no diplopia, loss of vision, or other visual disturbances. There was no history of fever. No history of trauma/foreign body entering the eye was reported. The patient was a daily wager working in fields. He had no previous history of refractive errors or squint, ocular surgery, or ocular trauma. There was no history of tuberculosis, diabetes, or hypertension. He had no history of travel or exposure to pets. On examination, vision in both eyes was 6/6 and fundus was normal. Anterior segment examination in the left eye was normal. Anterior segment examination of the right eye revealed conjunctival congestion and chemosis temporally. It also revealed soft, nontender, irreducible extraocular nodule of approximately 1 cm in size. Rest of the anterior segment and fundus examination was normal. Ocular movements were normal. Ultrasonography B scan revealed a thin-walled cystic lesion around the limbus near the lateral rectus muscle. The mass was removed surgically and sent for histopathological examination. Gross examination of the mass revealed a cystic grayish-white mass of approximately 1 cm in size. The mass was thin-walled and on opening there was a hard nodule in the center of the cavity. Microscopy showed a lamellar, eosinophilic wall, typical of cysticercosis. Presence of scolex and calcareous capsule confirmed the diagnosis of cysticercosis. There were sparse inflammatory cells in the surrounding. The microscopic pictures sent to Center for Disease Control (CDC), Atlanta through their web portal service reconfirming the diagnosis. Neurological examination and Computed Tomography (CT) of the brain was done to rule out neurocysticercosis, but both were negative. Other systemic involvement was also ruled out for cysticercosis. The patient received antihelminthic treatment in the form of Tab. Albendazole 400 mg for 1 month. Follow-up after 1 month was negative with no signs and symptoms of reinfection [Figure 1]. A 60-year-old housewife presented with itching over the forehead and right eye for 5 days. There was no history of headache, nausea, vomiting, or any systemic complaints. There was no history of any recent ophthalmic intervention. There was no history of contact with animals or recent travel. There was no history of allergy, asthma, hypertension, tuberculosis, or diabetes mellitus. On examination, vision in both eyes was 6/6 and fundus was normal. Local examination of the right eye revealed normal anterior chamber. Patient was prescribed steroid eye drops and antihistaminics (Fexofenadine 180 mg/day). Her itching aggravated with instillation of eye drops. Patient revisited the outpatient department with continuous watering from the right eye. Severe foreign body sensation and photophobia were also present. At this time, thorough examination of the right eye revealed a worm in the upper sub-conjunctival area. The worm was removed completely under local anesthesia. There was immediate relief from symptoms and the patient was discharged on local and oral antihistaminics. Further treatment was not necessitated in this case as only a single worm was present. Patient is asymptomatic since this episode. The worm was received in toto in the laboratory. It was white, thin, cylindrical, and approximately 8–10 cm long. Gross and light microscopy examination led to the diagnosis of Dirofilaria spp. The diagnosis of Dirofilaria spp. was reconfirmed based on gross and microscopic photographs sent to CDC, Atlanta through their web portal service [Figure 2]. A 45-year-old male patient presented with a painless mass in the left eye for the last 3 months. He had no systemic illness. He gave a history of swimming pool use during that time. The mass was excised and submitted for histopathology. Microscopic examination revealed numerous globular cysts representing thick walled sporangia containing numerous spores diagnostic of Rhinosporidiosis [Figure 3]. Infection with T. solium tapeworms can result in human cysticercosis, which can be a very serious disease if the brain or eye gets involved. Humans are the definitive hosts for T. solium with pigs being the intermediate host. Infection occurs through infective eggs in undercooked pork. Eggs or gravid proglottids are passed with feces. These mature eggs contaminate pastures and barnyards, where cattle and pigs ingest them. Upon reaching the alimentary canal of infected animals, the embryos are released, penetrating the gut wall and entering the circulation and organs. Humans develop a tapeworm infection by eating raw or undercooked pork. Cysticercosis is the development of extraintestinal encysted larval forms of T solium in various organs. Their effects depend entirely upon the location of the cysticerci. Most common sites are brain and subcutaneous tissue sometimes involving the eye, liver, etc. Ocular cysticercosis may affect any tissue of the eye either extraocular (subconjunctival or orbital tissues) or intraocular (vitreous, subretinal space, or anterior chamber). The ocular manifestations can vary from asymptomatic in early stages to rather destructive later on because lesions gradually increase in size leading to blindness in 3–5 years. Bilateral involvement is rare but multiple lesions may develop in the same eye., Intraocular cysticercosis usually occurs as a part of systemic infection. Isolated ocular involvement is uncommon in clinical practice. Basic laboratory investigations may reveal eosinophilia in complete blood count (CBC). Enzyme-linked immunosorbent assay (ELISA) detecting anti-cysticercal antibodies may be helpful in suspected cases. Radiological diagnosis in the form of ultrasonography B scan and CT scan are more reliable in the detection and determining the extent of disease. Fine needle aspiration cytology (FNAC) may be helpful sometimes. Histopathological examination should be routinely done after cyst removal. Surgical removal is mandatory in ocular cysticercosis. Cysts deep within the orbit are best treated conservatively with a 4-week regimen of oral Albendazole (15 mg/kg/d) in conjunction with oral steroids (1.5 mg/kg/d) in a tapering dose over a 1-month period. Ocular cysticercosis is a rare and preventable cause of blindness. 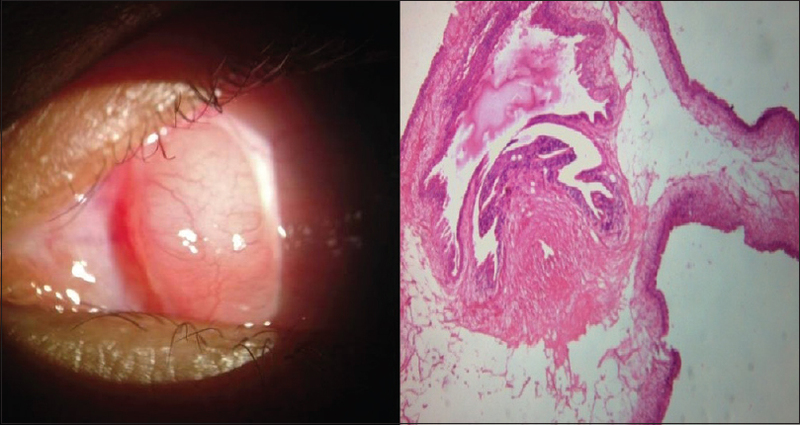 High level of suspicion along with use of appropriate diagnostic modalities is very crucial in the management of isolated ocular cysticercosis. Dogs and a wide variety of other animals such as beavers and horses are definitive hosts for Dirofilaria. Aedes, Culex mosquitoes are the vectors for Dirofilaria. An infected mosquito introduces third-stage filarial larvae of Dirofilaria into the skin of the definitive host. Humans are not suitable hosts for Dirofilaria species but only accidental hosts as they do not play a role in the propagation of life cycle. Immature D. immitis worms can reach a branch of the human pulmonary artery and trigger an inflammatory response. This may occasionally result in pulmonary nodules. The worms usually do not grow to maturity. D. immitis larvae tend to follow the same migratory pathway as in the canine host, ending up in the lungs, where they often lodge in small vessels causing infarcts and typical “coin lesions” visible on radiographs. In India, human ocular dirofilarial infections have been reported from Kerala in 1976 and 1978 initially. Later on, subconjunctival dirofilariasis due to D. repens were reported from several parts of India. The identification of the worm is done by studying the morphology of the fully matured worm both macroscopically and microscopically. Dirofilaria are identified by their thick laminated cuticle, broad lateral ends, and large muscle cells.,D. immitis can be differentiated from D. repens by absence of ridges. Surgical removal of the worm is one of the modalities of treatment in Dirofilaria infections. D. immitis causes microfilaremia in humans and may require the use of antihelmenthic drugs. The reporting of human dirofilariasis in general along with ocular dirofilariasis has dramatically increased since the last few years. This might be attributed to many factors including climate change leading to altered vector behavior and steep rise in travelling across the globe. Hence, diagnosing this emerging parasitic infection should not be accidental only. A high index of suspicion on the part of ophthalmologists/clinicians and knowledge about morphologic features of the worm by microbiologists should give us an accurate insight into incidence of dirofilariasis. Rhinosporidiosis is common in the nose, eye being relatively rare. The disease spreads from animal to humans. In a series of 49 cases, in Kerala they could trace a majority of infection to a pond. Park K. Taeniasis. Park's textbook of Preventive and Social Medicine. 23rd ed. Bhanot Publishers; 2017.p.302-3. Available from: http://www.cdc.gov/parasites/taeniasis/health_professionals/index.html. [Last accessed on 2018 Jun 18]. Simón F, Siles-Lucas M, Morchón R, González-Miguel J, Mellado I, Carretón E,et al. Human and Animal Dirofilariasis: The Emergence of a Zoonotic Mosaic. Clin Microbiol Rev 2012;25:507-44. Pampiglione S, Canestri Trotti G, Rivasi F. Human dirofilariasis due to Dirofilaria (Nochtiella) repens: A review of world literature. Parasitology 1995;37:149-93. Simón F, López-Belmonte J, Marcos-Atxutegi C, Morchón R, Martín- Pacho JR. What is happening outside North America regarding human dirofilariasis? Vet Parasitol 2005;133:181-9. Available from: https://emedicine.medscape.com/article/999727-overview/Tinea infections. [Last accessed on 2018 Jun 18]. Sharma T, Sinha S, Shah N, Gopal L, Shanmugam MP, Bhende P,et al. Intraocular cysticercosis: Clinical characteristics and visual outcome after vitreoretinal surgery. Ophthalmology 2003;110:996-1004. Topilow HW, Yimoyines DJ, Freeman HM, Young GA, Addison R. Bilateral multifocal intraocular cysticercosis. Ophthalmology 1981;88:1166-72. Kapoor S, Kapoor MS. Ocular cysticercosis. J Pediatr Ophthalmol Strabismus 1978;15:170-3. Rahman M, Brahma N, Bhanu Devi, Kuli JJ. 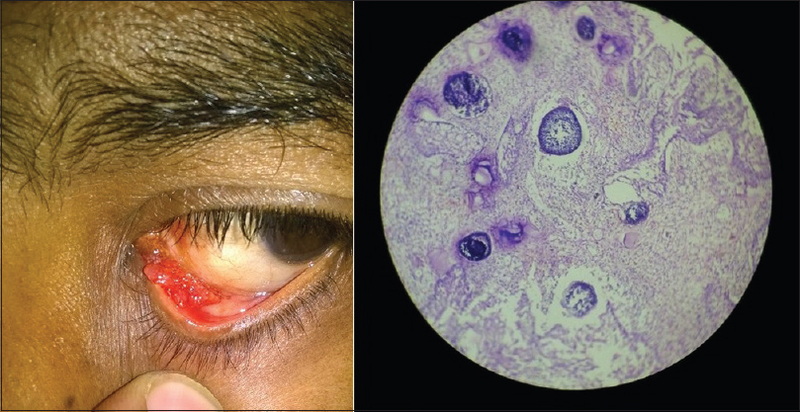 Isolated Ocular Cysticercosis-Case Report. IOSR J Dent Med Sci 2015;14:25-7. Pushker N, Bajaj MS, Chandra M, Neena. Ocular and orbital cysticercosis. Acta Ophthalmol Scand 2001;79:408-13. Kaur A, Agrawal A, Agrawal PK, Goel MM. Lacrimal canalicular obstruction by cysticercus cellulosae. Orbit 2006;25:163-5. Available from: http://www.cdc.gov/parasites/dirofilariasis/biology_d_immitis.html. [Last accessed on 2018 Jun 18]. Padmaja P, Kanagalakshmi, Samuel R, Kuruvilla PJ, Mathai E. Subcutaneous dirofilariasis in Southern India: A case report. Ann Trop Med Parasitol 2005;99:437-40. Kini RG, Leena JB, Shetty P, Hart R, Sumanth LD, George L. Human dirofilariasis: An emerging zoonosis in India. J Parasit Dis 2015;39:349-54. Achappa B, Madi D, Mahalingam S. An interesting case of subcutaneous nodule. J Clin Diagn Res 2013;7:364-5. Suseela V, Subramaniam KS. Rhinosporidiosis and the Eyes. Indian J Ophthalmol 1975;23:1-4.